“let’s do something easy” i hear this fairly often, not just from myself but my husband as well. usually just the opposite of being lazy, the ease we crave when we get home at day's end or head into a long weekend comes from a need to relax and refresh. that being said, easy meals can be problematic if you like fancy food. i just like really yummy food whether it’s fancy or not. luckily easy doesn’t have to be boring or less than. a few ingredients are quite often more than enough to make a brilliant meal. 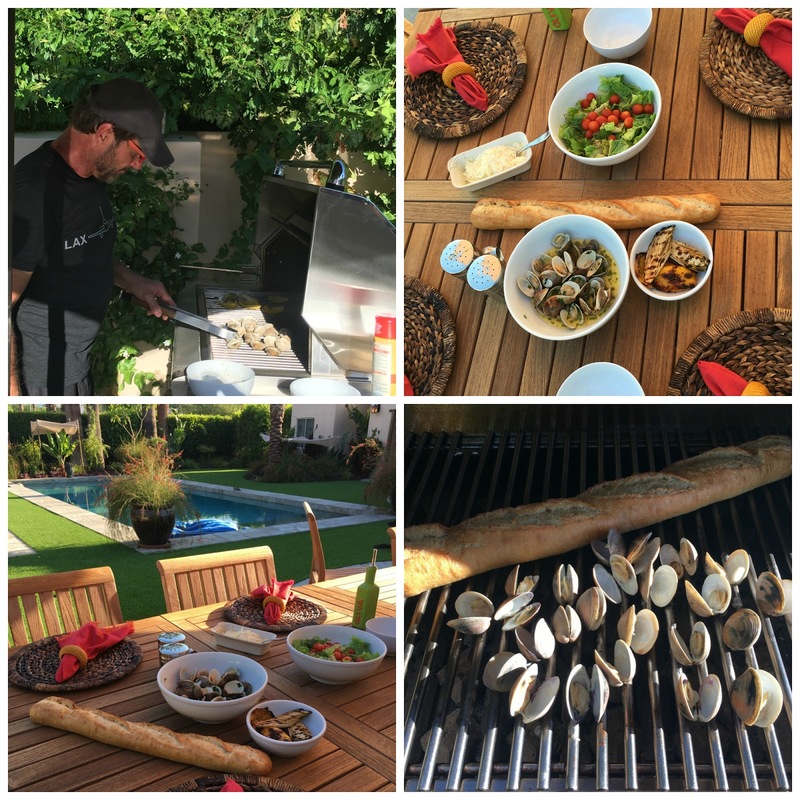 coupling my love for seafood with peter’s newfound passion for barbecuing has made for some interesting dinners this summer. chicken, burgers, lobster, veggies, salad, fruit and dessert….. you name it, i’m sure we’ve grilled it. and honestly, what’s labor day without a barbecue or a picnic? this labor day we’ll be making clams as our main course. make that tons of clams. i’m partial to the “little neck” variety so you need more than a few of them to fill up. a good scrubbing and a little heat along with an insane sopping sauce for a really fresh baguette is all you need. summer is waning all too soon this year and i’m going to savor every last bite! 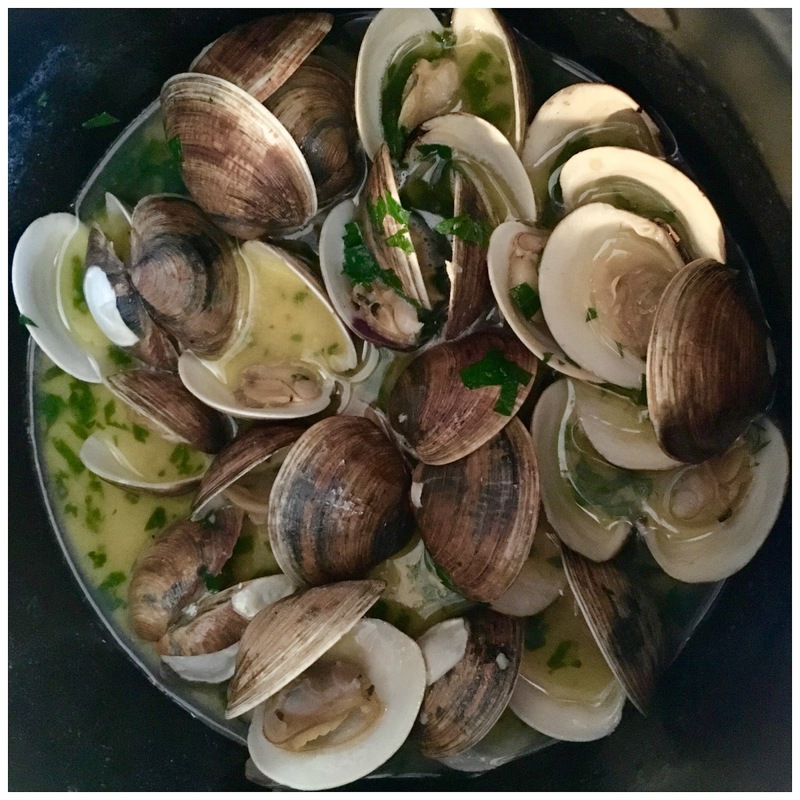 grill at low heat, close the barbecue for a quicker cook time, til the clams open. discard any that don't. melt one cube of butter in a saucepan. add 4-5 cloves of minced garlic and saute lightly. nothing worse than burnt garlic! simmer with 2 cups of dry white wine. let cook for a few minutes to incorporate. a few shakes of soy, mirin, and rice wine vinegar, along with sugar to taste. just a bit to cut down the acidity. add chopped italian parsely for garnish just after you've taken off the heat. toss with just-off-the-grill clams and serve immediately with fresh baguette and a simple salad. i used 2 dozen clams for the two of us and it was perfect. this recipe can be doubled, tripled... depending on the number of people you're feeding.